Anyone who has young kids knows how tough it is when you have no choice but to bring the child somewhere—like court. Recently, a Utah man who needed to make a court appearance was in just that predicament. “I’ve got kids myself, boy I know what it is to have rambunctious kids, ya know, and it’s hard to take them anywhere,” Officer Norris told KUTV. When it was time for the man to go into court, his daughter, Abi, was not allowed to stay with him. “He didn’t know what to do, so I took the girl by the hand and walked around. We went and got a drink and took giant steps-baby steps. Kind of the same thing I do with my own kids,” Officer Norris said. 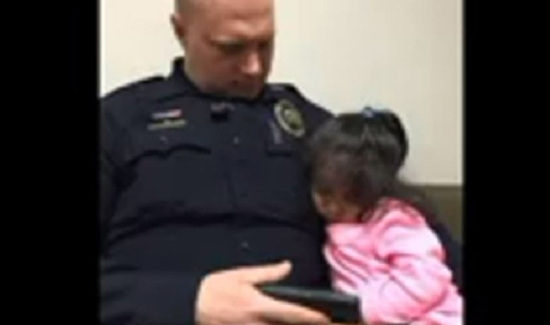 Aside from taking the little girl for a walk, Officer Norris pulled out his cellphone and the two watched cartoons. Before Officer Norris knew it, Abi was sound sleep.